Do you keep financial files in a notebook, your bills in folders and your checks in a check register? Are you finding it difficult to keep track of the finances of your company or know what your financial position is? With years of experience as a business owner, Intelligenz Business Solutions understands that nothing is more important that having a clear financial picture of your business. This cannot be achieved without accurate, clean and consistent bookkeeping. Most importantly, Quickbooks lets you know the financial state of your business at any time using Profit & Loss Statements, Balance Sheets and dozens of other reports, all only a click away. If you are already using Quickbooks, but you are having trouble making it work for you, we can help. Every minute you spend recording transactions and sending invoices, is that much time you are not spending growing your business. While maintaining accurate financial information is vital to your business success, it is not an activity that generates revenue. 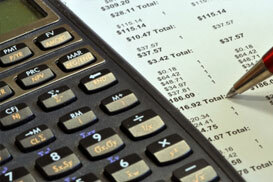 If you want to free up your time to work on your business, we can do your bookkeeping for you. Our services span from monthly reconciliations to complete bookkeeping including payroll. All this can be done remotely ensuring no disruption in day-to-day business operations. Intelligenz Business Solutions has extensive knowledge of other systems and resources that can help your business. Utilizing the information from your books, we’ll perform an analysis of your systems and develop standardized procedures based on that quantitative analysis. We’ll also make recommendations regarding systems that would best serve your business. The Internal Revenue Service estimates that about 40% of all small and medium size businesses in the US are subject to fines and penalties for failing to correctly report their payroll. In addition, it is well known that payroll is one of the functions that is best to be outsourced because it detracts management attention from the business. IntelliGenz Business Solutions offers the ability to let us focus on paying your payroll, your taxes and filing your paperwork while you continue to focus on making your business more successful. Contact us today to discuss how we can help.